Treatment Planners cover all the necessary elements for developing formal treatment plans, including detailed problem definitions, long-term goals, short-term objectives, therapeutic interventions, and DSM™ diagnoses. Documentation Sourcebooks provide the forms and records that mental health professionals need to efficiently run their practice. SARAH EDISON KNAPP, MSW, CSW, is a former school social worker who now devotes her time and expertise to helping educators and parents relate to children in positive and highly effective ways. 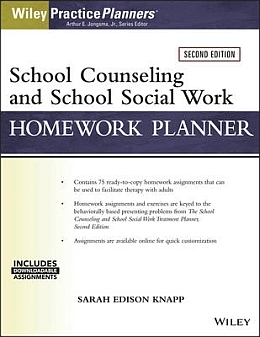 She is the author of several books including The School Counseling and School Social Work Treatment Planner, Second Edition and the Parenting Skills Homework Planner, both published by Wiley.